When Cdr. Singh developed diminished vision and was diagnosed to have cataract, he visited top eye hospitals in Navi Mumbai and Mumbai. During the course of a normal Cataract Surgery, a patient has to lie down on his back and a surgical drape is placed over the person’s face so as to prevent the spread of infection. However, Cdr. Singh’s particular condition made it literally impossible for him to lie down in flat position on an operation theatre table. He would get breathless and sit up in just a few minutes, making it impossible to perform the surgery. Cdr. 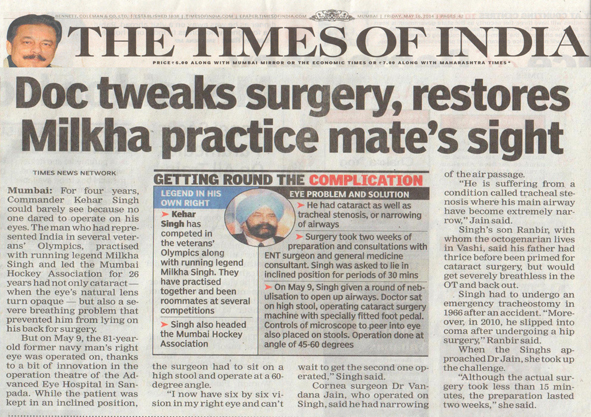 Singh was taken into operation theatre and was taken out without having the Cataract Surgery in Mumbai. The same story got repeated at 2 other eye hospitals in Vashi and Nerul and there seemed to be no hope for him to be able to see clearly. One day, Cdr. Singh got to know about how Advanced Eye Hospital in Sanpada had performed cataract surgery on a businessman with very curved backbone. Though having a different physical barrier, this businessman’s story was eerily similar to Cdr. Singh’s. Seeing a ray of light, Cdr. Singh had his son enquire about this eye hospital in Sanpada. To his delight, the Cornea & Cataract surgeon Dr. Vandana Jain was very open to taking up the challenge. An ENT Surgeon, Dr. Samir Bhobe at Vashi, was consulted and the team discussed the case at length trying to overcome the challenges imposed by Cdr. Singh’s condition and an action plan was made for the day of surgery. As a first step, Cdr. Singh was given medications through nose (nebulisation) in an attempt to keep his airways open for an hour prior to the surgery. He was then propped up on the operating table at a 45 degrees angle. Surgeon, Dr. Vandana Jain, first tried to perform the surgery in a standing position but was unable to reach the microscope to get proper focus of the patient’s eye. She then sat on a very high stool. Additionally, the foot pedal for the cataract surgery machine and the microscope controls were also placed on the stools so that her foot could reach the pedals. She was forced to bend forward at an angle of 45-60 to be able to reach the patient’s eye and perform the surgery safely. 15 minutes later, Cdr. Kehar Singh emerged from the operation theatre with a clear new lens in his eyes and a huge smile on his face. He was finally rid of his right eye’s cataract and could not wait to undergo the surgery for his other eye! True, sometimes good old creativity and the zeal to turn the impossible into reality go a long way rather than only the surgical skills and technological advances! Dr. Vandana Jain is a renowned Cornea, Lasik and Cataract surgeon and the Managing Director of AEHI. Dr. Jain has won best fellow awards and gold medals at Delhi University and L.V. Prasad Eye Institute and then further trained at Harvard, USA. 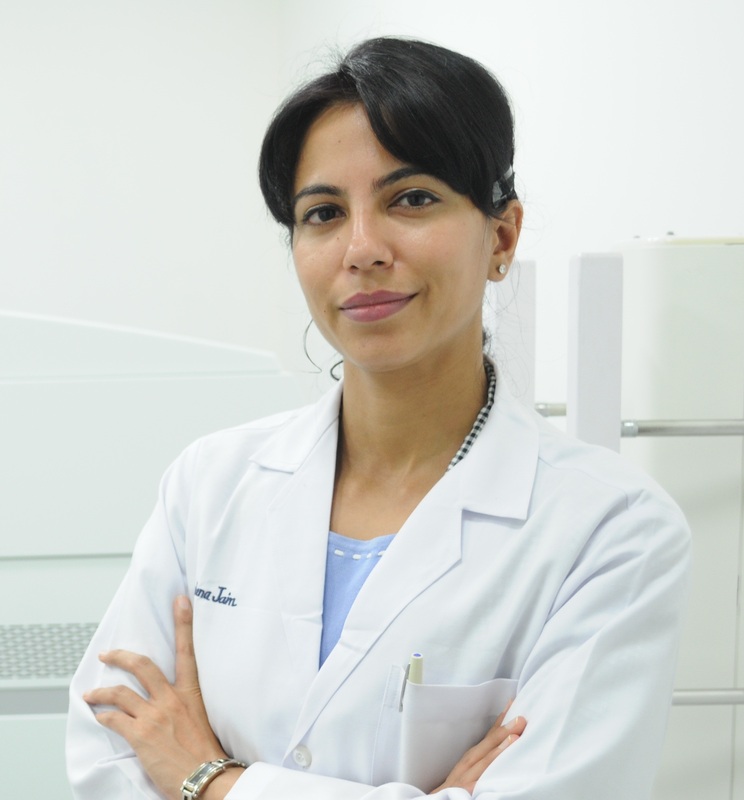 Having performed more than 10,000 phaco cataract operations, she has vast experience of dealing with all kinds of complicated cataract surgeries. According to her, cataract surgery needs to be customised to the patient’s needs and physical disability. She additionally believes that team work and alliance with other specialists help in planning and giving the best cataract surgery results to the patients. Cataract Surgery Centre at Advanced Eye Hospital and Institute in Navi Mumbai, India is one of the best cataract eye surgery hospitals in India. Diagnostic suits for pre-surgery measurements and check-up and the operation theatres are state-of-art and equipped with the best cataract eye surgery machines. Personalized care, infection free modular operation theatres and beautiful ambiance complement the cutting-edge eye care offered at AEHI. Besides treating patients from Kharghar, Nerul, Vashi and Panvel, patients from all over western India travel to AEHI for world class cataract treatment. If anyone in your family or you, yourself, needs evaluation for cataract, please call us at 02267313636, we are open from Monday- Saturday 9:30am-7pm.